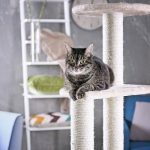 Maintaining your cat tree and keeping it clean is an essential step for any cat owner to routinely do. For people wondering how to clean a cat tree, we’re going to outline several effective and safe ways you can go about this to keep your cat tree looking like new. You can break this process down into several steps depending on the types of contaminants that are present on your cat tree. Additionally, you can spread this process out over several days depending on how much your cat wants to use it. Take your scrub brush and start brushing every carpeted area of the cat tree, beginning at the top and working your way down to the lower levels. Don’t forget to pay special attention to the areas where your cat tends to frequent like any perches, the sides, scratching posts, and the base. When your scrub brush starts to fill up with cat hair, you want to take your comb and run it through the bristles of your brush to remove any hair. You can toss this cat hair in the garbage and continue to clean your cat tree with the now hair-free scrub brush until you remove the majority of it. Once you finish using your scrub brush on your cat tree, it’s time to get your vacuum to go over any areas that you may have missed with the brush. Vacuum your entire cat tree, and make sure that you pay special attention to the corners, inside any houses, sides, and any tight spaces where your brush couldn’t reach. The vacuum is also good for pulling any cat litter or dirt from your cat tree at the same time it’s removing the hair. Once you finish vacuuming it, you’re ready to give it back to your cat for them to lounge and play on. For ground-in cat hair, you can get a glove damp and brush your hand over the entire cat tree. The glove will pull and loosen up any stuck hair for you to vacuum or brush away. A lint roller works well to gather stuck cat hair from items. Simply run the lint roller over the cat tree and toss the excess sheet when you finish. Make a point to routinely clean your cat tree every other week or so to keep up on it. Despite being pretty clean animals in general, accidents do happen. If your cat sprays, pees, or throws up on your cat tree, you’re going to end up with a stain that takes a little more work to remove. The first thing you want to do is lightly spray down the entire cat tree with the enzymatic cleaner because it has special enzymes that help break down the stains and lift them from the cat tree. Let it sit on the cat tree for five minutes or so after you spray it, and you can then wipe down the cat tree with your paper towels. The paper towels will clue you in on how dirty your cat tree really is, and they’ll help to remove the first layer of grime. It also helps to take away any lingering odors you may have from the stains. Once you finish here, you can mix a few drops of dish soap and water together before dipping your scrubbing sponge in it and running it over your cat tree. The rough surface of the sponge will work to help loosen any ground-in dirt and hair, and the sponge also works to remove any loose hair from your cat tree. The final step is to spray the cat tree with a mixture of warm water and hydrogen peroxide to wipe out any lingering germs or bacteria that may still be in your cat tree. Finally, wipe down your cat tree really well before you let it dry completely. When it dries, you can let your cats back on it. The first thing you want to do is mix a few drops of dish soap into warm water and put it in a spray bottle. You’ll spray this mixture directly on any stained or grungy areas on your cat tree before you let it sit for a few minutes to soak in. Once it starts to soak in, you can take your sponge or cloth and scrub at any stained areas until you begin to see the dish soap creating suds. If you have an upholstery-specific cleaner, you can use this with warm water instead of dish soap. You can either pull any moisture from the cat tree with your upholstery cleaner, or you can also blot at it with a dry cloth until it’s mostly dry. You have to let this dry completely before your cat gets back on it to prevent them from tracking more dirt back in, but it’s safe for your cat to use after 24 hours. Consider investing in a vacuum cleaner that is specially designed to handle pet hair. It usually has more powerful suction that allows it to remove stuck hair. You can treat any odors with specially designed sprays for light odors or granules for strong odors. You apply let, let it soak in for a few hours, and vacuum it up. Always use non-toxic cleaning agents, and be leery of the smell. If it’s too strong, your cat may start to avoid their cat tree. Take your cat tree completely apart once or twice a year and clean all of the small nooks and crannies. This is where hair and bacteria builds up. It’s important that you keep your cat tree clean to prevent bacteria from growing and thriving. We’ve given you several ways how to clean a cat tree, and you can try them out and see which one works best for your situation.